We’d love your help. 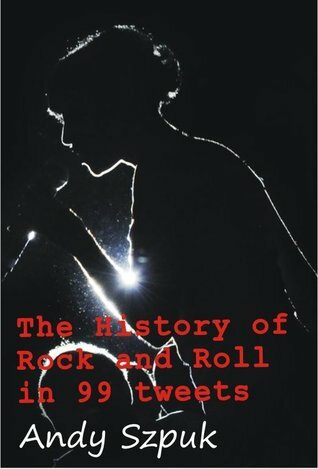 Let us know what’s wrong with this preview of The History of Rock and Roll in 99 tweets by Andy Szpuk. Harry's story weaves along like a getaway driver from a smash and grab, with the radio blaring. The soundtrack to his life throbs away in the background as you wonder what can possibly happen to H A twitter novel. Follow Harry as he rampages through six decades of romance, rock and roll, and mayhem. A story constructed in 99 short chapters, each one 140 characters or less. To ask other readers questions about The History of Rock and Roll in 99 tweets, please sign up. Cute, Twitter-esque poem incorporating popular titles into a story. It's not so much the history of rock and roll as it is a narrative using rock as a backdrop. Still, cute. Is there anything Twitter can't do? A fun little book. The song references make you think. Luckily, they are all cited at the end of the book. There are a few words I can use to describe this short story. Fun, cute, silly, and adorable. Andy Szpuk tells the story of a man and his ups and downs with rock -n- roll by way of song excerpts. You can't help but find yourself thrown back in time to your own "Glory Days" while reading it, as you find yourself remembering the songs and singing along. A definite must-read short story. Novelist and short story writer, based in Nottingham UK. Recently (2011), Andy's historical memoir, 'Sliding on the Snow Stone' has been published by Night Publishing. Examples and links to more of Andy's work, and other literature-related activities, can be found at http://andyszpuk.wordpress.com/.